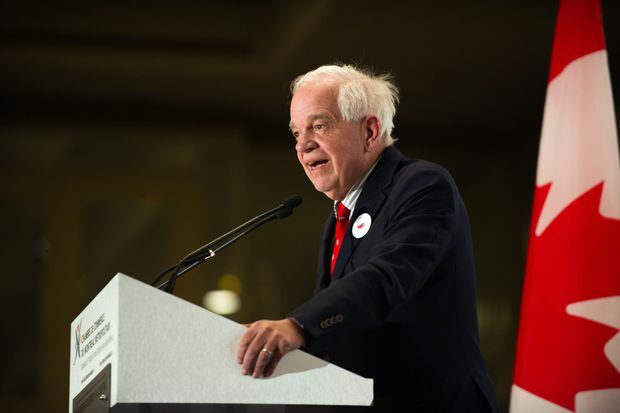 In this file photo from March 16, 2016, Canada's Immigration, Citizenship and Refugees Minister John McCallum speaks at the board of trade of Metropolitan Montreal. Canada’s envoy to China, John McCallum, apologized on Thursday for offering his opinion on how a senior executive of a Chinese telecommunications company could avoid extradition to the United States – a view welcomed in Beijing. The ambassador’s remarks to Chinese-language journalists on Tuesday drew calls for his resignation from Opposition MPs and criticism from former Canadian diplomats. Prime Minister Justin Trudeau did not directly address the issue on Wednesday, and on Thursday rejected the calls to replace Mr. McCallum. Mr. McCallum had said Huawei Technologies Co. Ltd. chief financial officer Meng Wanzhou had a good chance of persuading a Canadian court to reject a request for her extradition to the United States on allegations of banking fraud relating U.S. sanctions against Iran. He even suggested the Trump administration might cut a deal with Beijing to end the diplomatic crisis and allow Ms. Meng to return home in exchange for the release of two Canadians detained in China. Mr. McCallum’s speculation about the U.S. dropping its extradition request of Ms. Meng as part of a possible U.S.-China trade deal was taken seriously by top officials in the Trudeau government. After U.S. President Donald Trump suggested in December that Ms. Meng could be used as a pawn in the trade talks, Canada asked the Americans to ensure that two Canadians detained in China would be freed as well, according to a senior Canadian official, who was not allowed to speak publicly about the delicate discussions. The insider said U.S. officials listened to the Canadian request but insisted that the Meng case was not part of U.S.-China trade talks and her extradition was a matter that should be left to the Canadian and U.S. legal and judicial systems to resolve. Mr. Trudeau and his government had defended Mr. McCallum on Wednesday, declining to disavow what his envoy had said. One senior official, speaking on background, had even argued Mr. McCallum was trying to demonstrate to Beijing’s rulers that Canada’s justice system is fair and impartial and Ms. Meng would have the opportunity to vigorously defend herself. But commentators who are friendly to the Chinese government seized on Mr. McCallum’s remarks on Thursday to bolster Beijing’s assertion that Ms. Meng’s arrest was politically motivated and aimed at harming Huawei, which the United States says is a threat to national security. There are no indications Mr. Trudeau will seek the resignation of Mr. McCallum, a former Liberal cabinet minister who the Prime Minister named envoy to China in 2017 to pursue a free-trade deal with Beijing. Hours before Mr. McCallum issued the mea culpa, the Prime Minister was asked if he intended to recall or sanction the ambassador. He did not answer that question. Mr. Trudeau replied that his government’s focus is on getting detained Canadians Michael Kovrig, a diplomat on leave, and businessman Michael Spavor home safely from China and ensuring their rights are respected. “Making a change would not help release those Canadians a day sooner,” Mr. Trudeau told reporters on Thursday in Quispamsis, N.B. After Ms. Meng’s arrest in Vancouver, China detained Mr. Kovrig and Mr. Spavor on allegations of endangering China’s national security. The Conservatives demanded Mr. McCallum be fired, accusing him of intervening in a judicial process and bolstering the legal case of Ms. Meng, who is considered a member of China’s corporate royalty. David Mulroney, a former Canadian ambassador to China, said Mr. McCallum had eroded the Liberal government’s claim to zero interference in the Meng case. Mr. McCallum, who last year stated that Canada has more in common with China than the United States under Donald Trump, said on Tuesday that the extradition request has three serious flaws, including the U.S. President’s suggestion last month that he could intervene in the Meng case if it helped trade talks with Beijing. In addition to political involvement, he cited extraterritorial application of justice, and an argument that Canada itself had no interest in sanctions against Iran as potential defences Ms. Meng could use against extradition. He incorrectly stated that Canada was not a signatory to the Iran sanctions during the period of the U.S. investigation of Ms. Meng. Guy Saint-Jacques, who was Canada’s most recent ambassador to China, said the Prime Minister must replace Mr. McCallum and find a way to resolve what he described as the “worst crisis” with China since Canada established diplomatic relations in 1970. Mr. Trudeau reiterated on Thursday that Canada is following the law and the Meng case will have no political interference. “We will always stay grounded in defence of the rule of law and the integrity of our justice system, which of course includes the capacity for people to defend themselves enthusiastically, which will be fully afforded to Ms. Meng and in her rights within the Canadian justice system,” he said. Since Ms. Meng’s arrests, China also sentenced Canadian Robert Schellenberg to death in a sudden retrial of his drug-smuggling case. He was sentenced in 2016 to 15 years behind bars. Canada has asked for clemency and called his death penalty inhumane. Mr. McCallum’s comments will “certainly be taken by the Chinese government as evidence to support its long-standing argument that Ms. Meng’s arrest was a politically motivated one,” said Sida Liu, an expert on Chinese law and criminal justice at the University of Toronto. That carries a “dangerous” risk of validating China’s response, added Peter Jennings, the executive director of the Australian Strategic Policy Institute, who has previously served in senior strategic and advisory roles to Australian political leaders. “If it’s all part of political strategy, it’s perfectly legitimate for them to retaliate in kind – take a few hostages – because that’s how things are done,” he said. Still, at least one Chinese political scholar raised doubts over who Mr. McCallum was speaking for. Jerome Cohen, an expert on Chinese law at New York University, said he would not be surprised if Mr. McCallum’s words are repeated in the extradition proceedings against Ms. Meng.